Temple Law students pictured with Claudia Paz y Paz, former Attorney General of Guatemala. Words are things. They get on the walls. They get in your wallpaper. They get in your rugs, in your upholstery, and your clothes, and finally, in to you. One should never underestimate the power of words, for he who can use words skillfully, strategically, and cunningly may shape another’s mind in his hands. Indeed, rhetoric is an effective instrument, and a power to which the Trump Administration is no stranger—particularly as it relates to shaping public perceptions on asylum policy. Over the past few years, the conversation on immigration, once grounded in human rights, have given way to more serious discussions predicated on national security and labor. Trump’s logic stems from the idea that a strong America requires a thriving labor market, which is the product of an impenetrable border. Such desires to preserve the American worker and defend him from foreign nationals have given rise to an ardent nationalist movement. To his base—voters suffering from the woes of a sluggish labor market, stoked by fears of the “dangerous foreigner”—this message was welcomed with open arms, and on November 8, 2016, Trump was elected to the highest office in the land. Exactly two years later, on November 8, 2018, I and a group of students from the Temple University Beasley School of Law made our way to Washington, D.C. to meet with leading immigration organizations to discuss and bolster our research on country conditions in the Northern Triangle (Guatemala, El Salvador, and Honduras). For the past year, we have been engaged in a project spearheaded by Professor Jaya Ramji-Nogales and Washington on Latin America (WOLA), a research and advocacy organization that advances human rights in the Americas, to compile annotated tables of contents from trustworthy sources. Our goal is to build a compendium of facts, statistics, and anecdotes that will strengthen asylum applications, with a main focus on each country’s inability and unwillingness to protect its citizens from persecution at the hands of non-state actors. 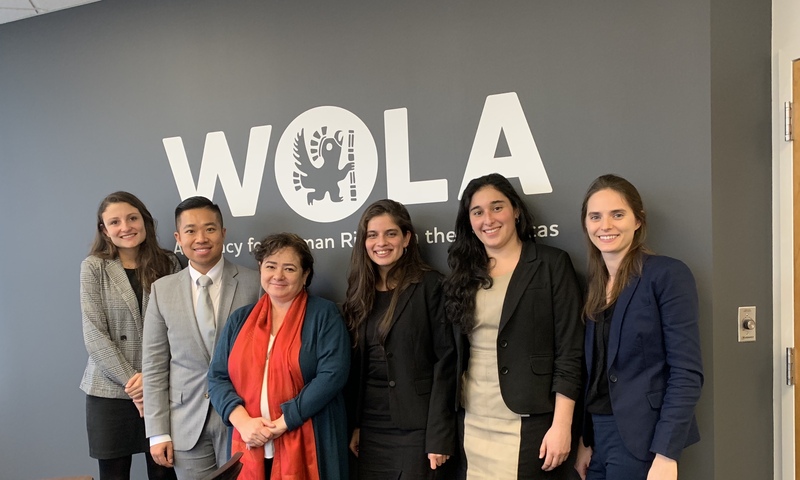 We arrived on Thursday afternoon, and met with several members of WOLA, including Geoff Thale, Vice President for Programs; Maureen Meyer, Director for Mexico and Migrant Rights; and Kevin Amaya, Research Associate. There, we learned of WOLA’s efforts to inform and empower U.S. policymakers to shape fair, meaningful, and comprehensive border and immigration policy. The organization’s work has proven remarkably influential in recent years, evidenced by Congress’s 2018 decision to follow WOLA’s recommendations to increase funding for official ports of entry in lieu of a border “wall,” and deny funding for increased Border Patrol hires or the number of detention beds. That evening, we attended a reception hosted by Alianza Americas, a transnational network of Latino and Caribbean government, non-profit, and labor organizations that shape and influence socioeconomic policies in the Americas. The event took place at the historic Mott House, located directly across from the U.S. Supreme Court. Several leaders from member organizations were honored for their contributions to immigration reform. I even had the opportunity to speak with a congressional staffer, who informed me that Congress often utilizes information disseminated from such organizations to inform their policy objectives. The next day, Alianza Americas convened its 2018 Asamblea de Liderazgo (Leadership Assembly) in the wake of a high-stakes midterm elections that ultimately resulted in a new Democratic majority in the U.S. House of Representatives. It’s premier panel, “Resist, Connect, and Transform,” featured U.S. Representative Jesús “Chuy” Garcia; U.S. Representative Jim McGovern; Oscar Chacón, Executive Director of Alianza America; and was moderated by Tsi-tsi-ki Felix of Entravision. The discussion also included an audience of migrant leaders, advocates, and members of the public. Through a series of Q&As, Reps. Garcia and McGovern stated they were hopeful that the first one-hundred days of the 116th Congress would be marked by legislative momentum to protect Temporary Protected Status (TPS) and Deferred Action for Childhood Arrivals (DACA) beneficiaries—policies that could affect nearly one million people. After the panel, we met privately with Rep. McGovern, who is also the Chair of the House Rules Committee, the congressional body that determines which bills will move to the floor for a vote. In the words of Rep. McGovern, the Committee is effectively “the arm of the leadership.” Rep. McGovern guided us through the process of lawmaking in what I would describe as a much more captivating, grown-up version of Schoolhouse Rock. We learned how ideas made their way through the legislative machine, yielding laws that land squarely within our professional practice. Rep. McGovern also reemphasized his goal to provide a solution for DACA recipients, but stated that the national rhetoric on immigrants and specifically, asylees must change. Instead of viewing immigrants as criminals, Rep. McGovern suggests viewing them as a contributing part of our society that make up a significant portion of our workforce. I additionally posited that perhaps it is a question of visibility, and that the national opinion on immigrants may be changed much like history has demonstrated for the LGBTQ community. In short, the more immigrants and refugees that one personally knows, the more perceptions about immigrants as a group will change. Rep. McGovern agreed. Next on our agenda was a lunch meeting with the staff attorneys of Capitol Area Immigrant Rights Coalition (CAIR), an advocacy group dedicated to immigrant adults and children at risk of detention and deportation in the Washington, D.C. region; Kids in Need of Defense (KIND), a legal services provider to unaccompanied minors in immigration court; and the Washington office of the United Nation High Commission on Refugees (UNHCR), the United Nations body that protect refugees, forcibly displaced communities, and stateless people. Here, we learned about the daily challenges of a career in public interest, and caught a glimpse of the life of a practitioner of asylum law. The challenge I found to be most intriguing was the need to constantly adapt to an ever-shifting legal environment moved by omnipresent political winds. This insight proved invaluable, as we ultimately revisited our project to develop a modular system that would be useful in spite of great political uncertainty. To end our trip, we were introduced to Claudia Paz y Paz, former Attorney General of Guatemala, and a leading candidate for the 2013 Nobel Peace Prize. During our inspirational chat, Claudia spoke about her years as Guatemala’s first female Attorney General, the changes she implemented to fight institutional corruption, and her subsequent escape from Guatemala. I was—and still am—awe-struck by Claudia’s bravery as she single-handedly reduced Guatemala’s national crime and impunity rates while standing up to powerful drug cartels and corrupt politicians. Today, the battle against Trump’s demagogic immigration policies rages on. On December 21, 2018, the U.S. Supreme Court, in a 5–4 vote, refused to permit the Trump Administration from automatically rejecting asylum bids by people crossing the U.S.-Mexican border illegally. Even so, the past two years have witnessed virtually no Congressional oversight of even the most controversial immigration policies. However, this will likely change with the Democrats now in control of the House of Representatives. I am sure that I speak for my peers when I say that we are immensely grateful for a trip that went well beyond that of a typical law school experience. Wielding words and rhetoric, perhaps we, as the next generation of American attorneys, may be able to transform the narrative on immigration in our social fabric, and usher in a return to days where our asylum policies were based primarily on preserving an individual’s unassailable human rights.